This class is fun on so many levels! 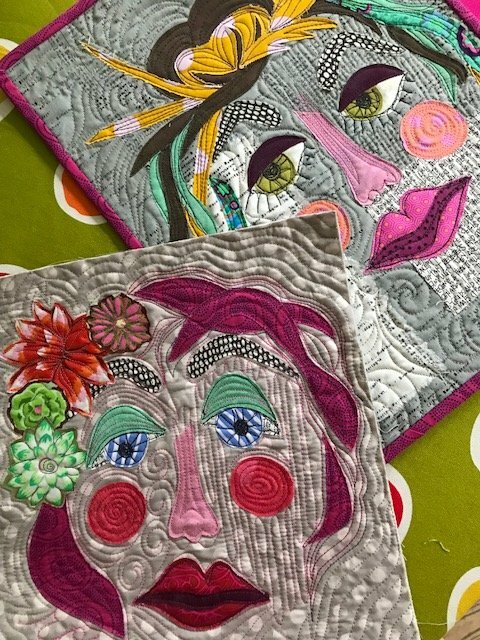 It was inspired from Melissa Averinos new book, “Making Faces in Fabric”. If you have taken Susan’s Machine Quilting Classes this is a great addition to improve those skills. We will first create a simple (funny) face in the morning using fabric collage techniques (and NO you do not have to be a portrait artist!) using unique fabrics, then in the afternoon we will machine quilt all the details such as eyelashes, cheeks, hair, etc. It is easy to create a face if you don’t have to make it look like anyone special. Just play and have fun with it!!! These could be made into placemats, small wall hangings, tote bags, pillows and more! This will be a no stress day of playing with fabric and threads! Small pieces of fabrics for Eyes (white and color), Noses (pink or beige/brown), Cheeks (pink, red or coral), Lips (pink or red. Hair (any color! Even pink or blue! ); dots, stripes, small prints and brights are really fun to play with! If you want a bird in her hair that is fine too! So look for Motif fabrics to play with. Very Light Weight Fusible such as Misty Fuse, Light Wonder Under, OESD Soft Web or Soft Fuse, 1/2 Yard or so. Backing Fabric (any print is fine), but Grunge or Solids make for great stitching designs! Questions about signing up please contact the shop.